What is a To Do list? A To-Do list planner is a simple method of tracking the tasks of the team members, which can be done using many different applications (Word, Excel, MS-Project, etc.). This article focuses on the Excel and MS-Project options. Provides an indication of the task status with the task indicator. If a task is RED then the task is due today or overdue. If AMBER then task is due in next 3 days. If GREEN that means the task is due beyond next 3 days. Template sorts the tasks based on due date so that the project manager can focus on tasks which based on due date and priority. 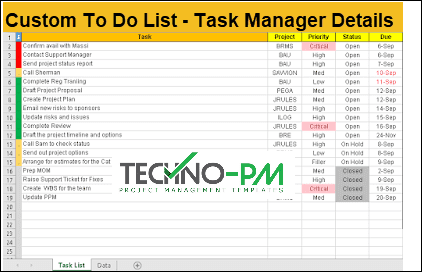 Tasks can be sorted so that task is displayed on the due date and task status. Task sorting can be done using shortcut Ctrl + L. The template can handle up to 10 projects and each task can have project, priority, status and due columns. The dashboard shows no of tasks open and how many critical, high and medium. 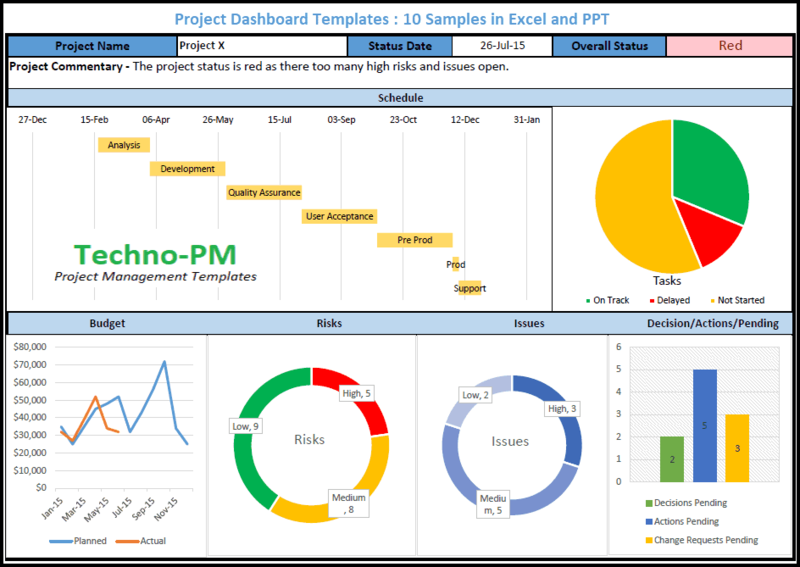 A bar chart displays the total task open for various projects. Due dates are validated and highlighted if they fall on weekends. The excel template has two tabs - task list and data. The task list tab contains two main sections - Tasks and the dashboard. Task calendar which shows an overview for the next 10 days. It also highlights today's date. The data tab has auto calculated table and lists. Populate the projects list on the data tab. Add tasks one by one with the project, status, priority and due date. After adding a new task press CTRL + L to sort the tasks. The tasks will be sorted based on the due date. Project names can be actual projects or work streams like BAU, Team Management etc. As and when you complete the task changed the task status to closed and then press CTRL + L for task sorting. Every time you open the sheet make sure you CTRL + L so that you can start your focus on the tasks which are an immediate priority. The attached Word template provides a detailed example of a To-Do list. WBS - The number represents which part of the WBS block the task is a part of. This can help with attaching predecessors to the task from other ones which are a part of the same block. This column can be replaced with a simpler “number” column. Owner – This column should have only one name per row, which represents who is responsible for completing this task. The owners’ name must be their actual one and not their title. For example: Dave Bernstein, and not “JIRU programmer”. Task – This column is the heart of the list, and represents what needs to be done by the owner. It should clearly contain what needs to be done so that the owner won’t need further explanations in order to complete the task at hand. Due Date – This column tells the owner when they are expected to complete the task, in the form of a calendar date. Finish Date (also referred to as “Actual Date” or “Estimated End Date”) – This column is also in the format of a date, and allows the owner to present their estimation of when they plan to complete the task in case of a delay. It can also serve to present when the task was actually done, for the lessons learned sake. Status – This is usually a drop-down list, and allows the owner to update the reader of the list on how the task is progressing. The more common attributes of the list are: “Not Started”, “On Track”, “At Risk”, “Postponed”, “Done”, “Cancelled”. Any other attributes can be added to this list. Predecessors – This column allows the owner of the task to specify which task needs to be completed in order for them to begin their task. This can be done by way of a WBS number, or by describing the task in free text. Comments – Allows the owner of the task to explain in free text any clarifications, help needed or updates regarding the percentage done so far. For example: “We’ve completed writing 7/23 (30%) scripts. In order for us to complete the remaining 16 scripts, the client must make the new testing environment available”. Using the MS-Project to create a To-Do list is quite similar to the Excel option, where the main difference is that some columns are automatic and named differently. 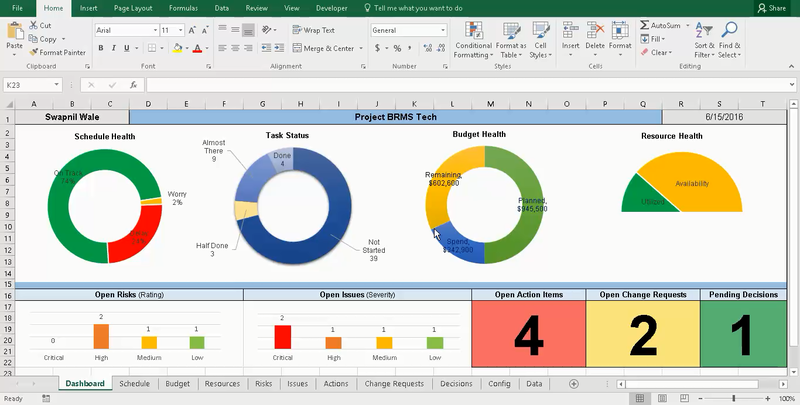 The best approach when using an MS-Project file to create an individual To-Do list is to insert all of the tasks into one file, and then simply filter the “Resource” column in order to see all of the tasks which are under any one team members’ responsibility. There are few differences when it comes to using MS Project as a To Do List. WBS: Is constructed automatically in the application but can be manually overwritten. Owner: Is referred to as “Resource”, and automatically calculates the workload. Task: Is referred to as “Name”, but otherwise the same. Due Date: Is referred to as “Finish”, but otherwise the same. Finish Date: Is referred to as “Baseline Finish”, and needs to be set by using the “Set Baseline” option: “Project Tab -> Set Baseline -> Set Baseline”. Status: Needs to be inserted as a “Text” column and customized to include the attributes above. Predecessor: Is referred to by the row number of the task in the work plan, but otherwise the same. Comments: Is referred to as “Notes”, but otherwise the same. Most projects have a roadmap (high-level plan), a detailed plan and many logs (risks, deliverable, RACI, etc.). These files explain what needs to be done in order for the project to be successfully completed, but not necessarily what each individual team member in the project needs to do. Hence you need a To Do list. It is important that a project manager manages his/her tasks effectively. 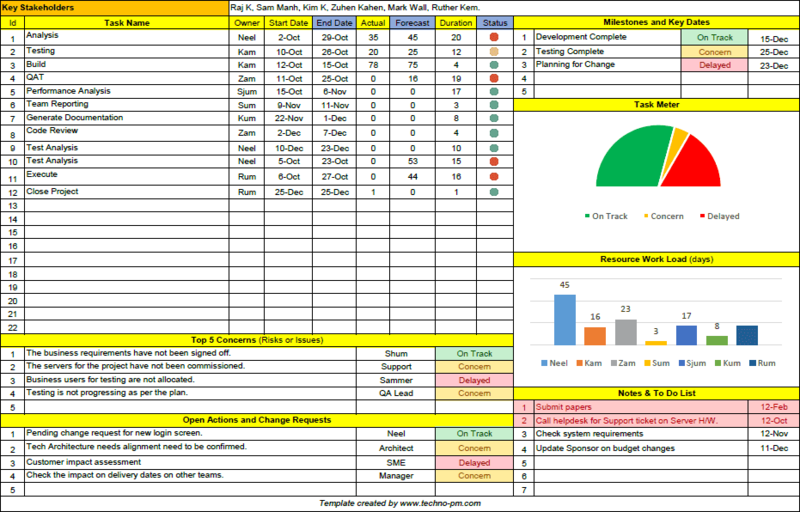 This personal task management template is loaded with features like sorting, highlighting task status and task dashboard to show key highlights. Since bringing a project to successful fruition is a complex endeavor which requires team-work and each team-member relies on their colleagues, a To-Do list assists with splitting the tasks between them. The list is name specific, and details the basic information of each task: Its name, owner, due date, comments and status. It is possible to add more information to the list, such as predecessors, successors, WBS, reasons for delay, etc. The PM and TL’s can use the lists to track their individual team-members’ progress, and also for evaluating their quality of work and efficiency. Once all of the tasks in all of the To-Do lists are completed, the entire project should be as well.